Fast Factor Boot is a completely new feature to the 750GB Momentus XT series, born from the nascent logic used on the first generation Momentus XT hybrid drives to speed up system boot time by loading a boot state onto quick NAND flash. In the first generation drives, boot states were stored in the 500GB Momentus XT's 4GB NAND flash cache along with everything else. What happened with systems that were infrequently booted up, or which saw heavy use, was the boot state data was eventually written out of the cache and boot speed improvements went out the window. The new 750GB Momentus XT drive addresses this logic loophole with by assigning a protected portion of the 8GB cache to store boot state data. The data is partitioned from the remaining cache so even if the PC system is infrequently restarted, it remains ready and waiting for the next boot. According to Seagate representatives, Fast Factor Boot works by capturing the first 45 seconds of boot data after a fresh install. It takes about 3 boot sequences to learn a state to full potential and will continue to learn as the boot state of your system changes. In PCSTATS tests the 750GB Momentus XT saw the following boot speed improvements from power off until the Windows 7 Start Button was visible on the desktop. In each test the drive was freshly installed with Windows 7. A quick word before you digest the boot times listed above; the test system we used - a Gigabyte G1.Assassin - was generally slowed while booting due to a pause while DMI devices registered. Seagate's Fast Factor Boot appears to accelerate Windows boot time once the Windows logo appears, the more programs installed the more positive impact it will have. Fast Factor Flash Management describes a set of tools which are completely transparent to the user and computer system - neither user nor operating system has direct access to the drive's flash memory. For the sake of data integrity, data is always written to the drive's HDD first, then copied over to the SSD if the following qualifications are met. 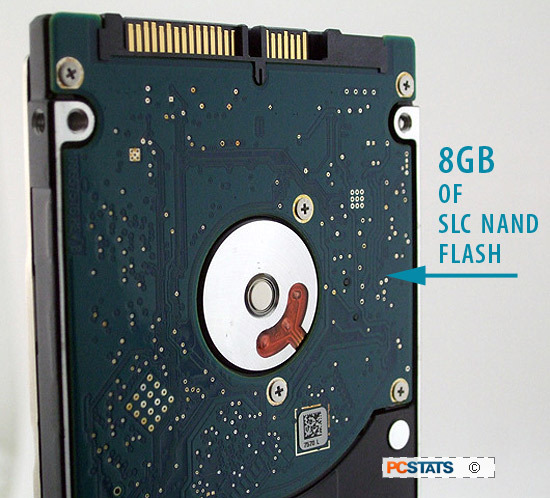 PCSTATS mentioned that the 8GB SLC NAND flash acts as a read cache for frequently accessed data, however to extend the life of the NAND flash as long as possible, certain data qualifications must be met before data is written to the NAND flash. 1) Data must be frequently and repeatably accessed, and 2) it must be 'hard to get to.' Only when these conditions are met is data is considered 'qualified' and written to the NAND flash according to Seagate. For example, data is stored in what are called Logical Block Addresses (LBA's), these are scattered around the drives storage platters and may be sequentially written, or spread out on different sides of the platter, accessibly by a few different read heads. If the drive can quickly access data written on a platter, it will. If the Factor Flash Management knows that the data is hard to get to (slow access times, fragmented) because it is split up over several read heads, it will store this data to the NAND flash so the next time it's called it will be quickly served. Fast Factor Write was dropped from the initial launch of the 750GB Momentus XT drive and likely postponed till Q1-Q2 2012. The preliminary outline of the technology is interesting enough that PCSTATS felt compelled to touch base on in this review regardless. Please remember that of this is subject to change. In one sentence, Fast Factor Write stores back end operating system metadata to the 8GB NAND flash until a larger write takes place. When a user-initiated write occurs, the collected system metadata is written along with the user data to the hard drive platters in one go. As perhaps thousands of metadata writes occur throughout a user session, the point of this technology is that it collects 'house keeping writes' and decreases hard drive power use. If Fast Factor Write is rolled out as expected, it will allow a new APM power mode to be enacted that could drop HDD power draw by perhaps 25%, says Seagate. Company representatives tell PCSTATS the technology may be implemented by a simple firmware update. The Momentus XT uses the new Advanced Format 4K (4096-byte) sector size which is supported in Windows Vista and Windows 7. The Momentus XT can be optimized to work with Windows XP and older versions of Microsoft Windows by following these instructions provided by Seagate. Alright, let's power up the 750GB Momentus XT SSHD and test it!. The details of how the 750GB Seagate Momentus XT SSHD ST750LX003 hard drive test system was configured for benchmarking, including the specific hardware, software drivers, operating system and benchmark versions are indicated below. In the second column are the general specs for the reference platforms this SATA III hard drive is to be compared against. Please take a moment to look over PCSTATS test system configurations before moving on to the individual benchmark results.